We so close to being able to WEAR OUR SWEATERS! Isn't it amazing? Can you imagine yourself in it? Do you have a first outfit picked out for it? My answer is yes to all of these questions! Blocking a sweater is easier than it seems. I think blocking a shawl is more challenging since they often want you to use a ton of pins and blocking wires to create a specific shape. In the case of the Carbeth Cardigan we're just going to get it fully saturated, lay it out correctly and then let it dry. Letting it dry completely is the hardest part because I just want to get in there and put it on. A bucket large enough to hold enough water to fully submerge your sweater. Wool wash such as Soak. 3-4 large towels. I use what I call "dog towels" which are the old spare towels we all keep around for the day the dishwasher leaks. However, even if you don't have old towels you can safely use your normal towels with Ewe Ewe yarns. Our yarns are 100% washable and the colors don't run so there's no fear of color bleed. Blocking mats or trash bags. Weird combo, I know but you'll see! Straight pins if desired. I didn't end up using them but you may want to. An empty area your dog won't be. To prepare your sweater for blocking you should have all the buttons attached and the ends woven in. A trick I learned from The Unapologetic Knitter is to weave in the yarn ends but not trim the tails until after the project is finished drying. Trimming the ends after blocking allows the yarn ends to get comfortable in their new home and you can trim them off on the inside of the sweater after it's dried. This helps prevent any strange poking ends! Set your sweater in the bucket and add a bit of wool wash. Fill the bucket with water to cover the sweater. Your sweater may float but you can gently continue to submerge it until it stops bubbling. Leave it to rest in the water for about 15-20 minutes. What's wool wash? I use Soak which is a rinse-free laundry soap that smells great. 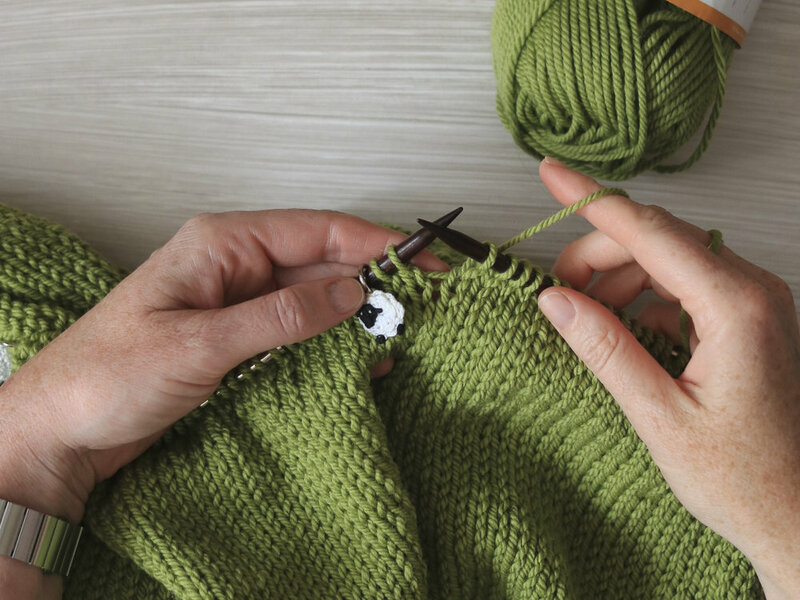 You can just block your sweater with water but adding a wool wash helps soften the fibers even more. When the timer's done gently drain the water from the bucket being as gentle to your sweater as possible. Do not wring out or lift your sweater. Hold the sweater to the edge of the bucket and pour out the contents. Lay down 2 towels on a hard flat surface and roll the sweater out onto them. Your sweater will be very wet and it's going to feel a bit like you're wrestling an octopus. Position it on the towels so it looks pretty reasonable. Add a third towel and begin to roll the sweater in the towels pressing firmly and rolling tightly. 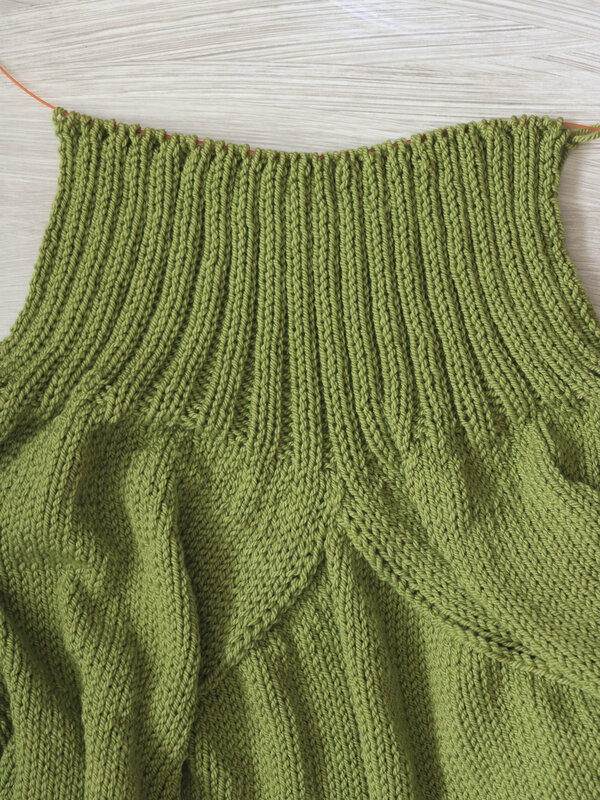 This method will gently wick the water out of the sweater without misshaping it. Now, the final step! Setting your sweater to dry. If you have blocking mats this is the time to use them. I don't own any, I'm not sure why I don't, I just haven't bought them yet. However! I did learn a good tip from an Drea Renee Knits pattern -- if you don't have blocking mats use trash bags instead. It doesn't sound very glamorous but I'm giving it a try. The idea is that by pinning out your project on plastic the water will be forced to evaporate upward and into the air. If you just set it on a towel on carpet the moisture could linger down below. By adding the bags we're hoping for a faster drying time! Arrange your sweater with the buttons buttoned and the bands set in place. Arrange the collar so it's straight. Lay the decrease lines so the are perfect angles from the neck to the underarm. There is no need to stretch or warp anything here, just gently work your way around the sweater smoothing it to wear it needs to be. It's important to let your sweater DRY. Completely dry. It's hard to do but give it time because the result is worth it. How was it? Did you finish? How did you do on your Carbeth Cardigan? Did you have fun? Did you finish your sweater? Send me a picture! Check in online on Instagram with the hashtags #BaaBaaCarbeth and #EweEweKAL. Follow @eweeweyarns on Instagram now! Plus you can join my Ewe Ewe Yarns Ravelry group if you like that type of thing. Whichever! Oh, my! We are SO close to being done. Today we're all about making the finishing edge for the button band and buttonholes. It's a fun stitch to work and these steps go quickly. We start by picking up 8 stitches at our folded collar. This is a "pick up and knit" situation, not just pick up like we did on the collar fold. Be sure to pick up the stitches through both layers of the folded collar. Now that we have all of stitches on the needles we're ready to start the i-cord edging. We'll add two stitches at the beginning using the e-loop or thumb cast-on. This is the quickest way to add stitches to a needle and there's a good tutorial here. Working the i-cord edge is fun and fast. I use a DPN to knit my stitches onto in conjunction with my long circular needle that is holding all the stitches on my button band. First, knit one stitch. Then knit 2 together through the back loop. Then slide those two finished stitches back to the lefthand needle. Repeat that all the way down the button band edge. So pretty! I think this is the nicest finishing edge I've ever had on a sweater. Now we get to work the other side where we'll add buttonholes. The steps say to use another needle but I just added my needle tips and yarn and picked up straight to the existing needle. Our next step is to figure out where the buttons will go. 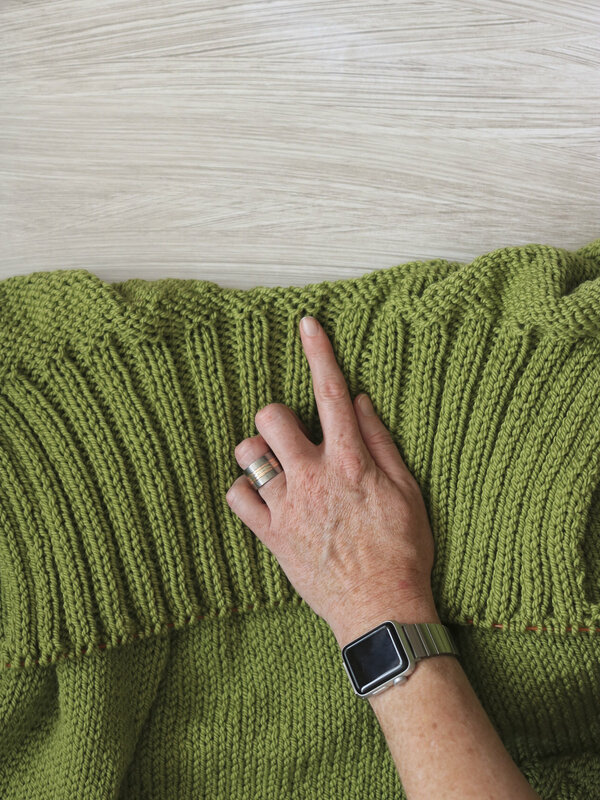 I am using 6 buttons as the pattern recommends but if you added a few extra inches to the length of the sweater then you may want to add an extra button or three. It's up to you. First I started by laying the sweater flat and arranging my buttons where I thought they looked nice and felt evenly spaced. I didn't count any stitches. I knew I'd want one at the top, one at the bottom and one at the base of the collar. The other three I set fairly equally spaced in between. Then I placed my clip-on markers at the corresponding spot on the other edge. After I decided that I liked where everything was sitting I went a step further and added stitch markers where the buttons had been. This way I can just rest the sweater in my lap to sew on the buttons rather than having to continuously line it up to make sure I'm in the right spot. Now we work our i-cord edging again but from the other end and we're adding in buttonholes! The buttonholes are just i-cord that isn't attached. I found it easiest to use 2 DPNs while working this edge, one to knit and then a spare to use when working a buttonhole. We're working "applied i-cord" and just regular "i-cord". To begin, add 2 stitches as before then work three rows. Your first button should sit right about here at the bottom edge of your sweater. Rather than moving your stitches back to the left needle you'll pull the yarn behind and work plain i-cord for 3 rows. When you've stitched those then continue back to working the applied i-cord until you reach your next marker. And there you have it! We have buttonholes on our sweaters! Now you can sew on your buttons, I know I'm going to do that tonight because I'm so excited to finish this up. When you're finished with the button bands then we're ready to graft the underarms. I have a tutorial on the Kitchener Stitch here. You'll place your live stitches back on to DPNs, hold them parallel and then work the Kitchener Stitch to graft them together from the RS of the work. Check in, ask questions, keep knitting! We're ready to knit the neckline and fold it down to create the tidy stand-up collar for the Carbeth Cardigan. We're going to make a knitted hem using a 3-needle bind off. Neck rib on the Carbeth Cardigan using Baa Baa Bulky yarn from Ewe Ewe. The ribbing will be folded in half and joined to the inside of the sweater by picking up stitches and then working a 3-needle bind off. To do this we're going to pick up stitches on the row before the ribbing starts. We need a second circular needle and we'll be looking at the inside or wrong side of the sweater. Locate the row at the bottom of the ribbing. It's easily identified by the purl bumps at the end of the ribbing. With our second circular needle and starting at the left front edge, pick up 4 stitches over the button band and then proceed along the row just below the ribbing. We are pick up stitches from the right to the left. Picking up stitches at the neckline. Keep in mind we're not doing "pick up and knit" here. We're just doing "pick up" meaning sliding these loops on a needle. No extra yarn required here. Picking up stitches at the neckline of a Carbeth Cardigan. As we move along the stitches are getting captured on this needle to just kind of hold on to them for the next step. Be sure to pick up 78 stitches on this new needle. There will be 4 from each button band plus the 70 collar stitches. A 3-needle bind off is easier than it sounds and it makes closing this hem simple because we have matching stitch counts on each needle. 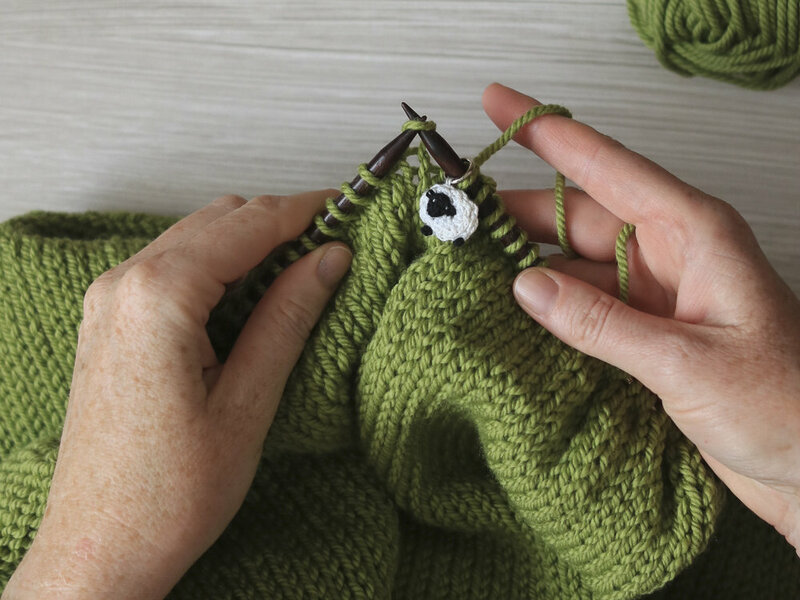 To perform a 3-needle bind off: Align the two working needles in a parallel manner. Insert a third needle as if to knit on the working needles. Knit these two stitches together. 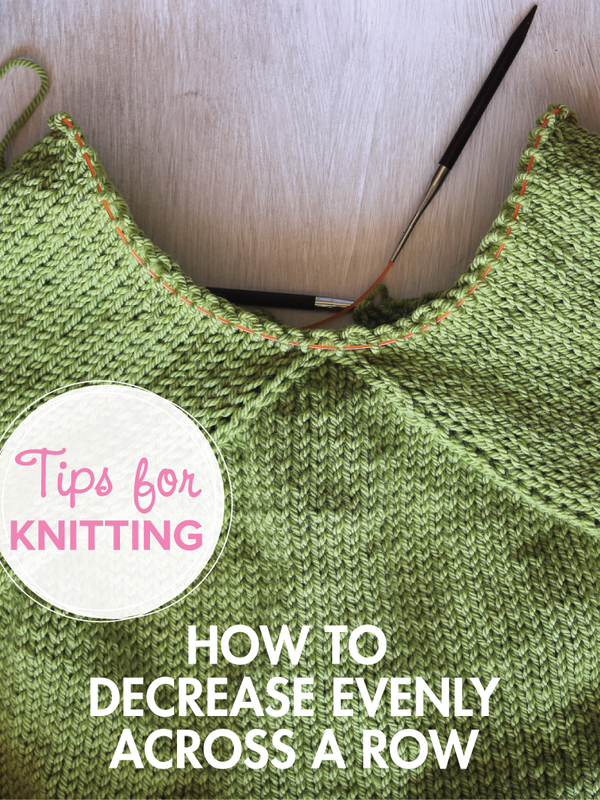 Knit a second stitch in the same way and lift the first stitch over and off the third needle. As you work along your 78 stitches you'll see the stitches combining to create a hem! Finished! Hemmed collar from the back of the sweater. Looks like a smile! When you're done you should have a nice tidy edge like this! We are closing in on this beautiful sweater creation! Our next step is to knit the button bands and to do that we have to pick up the stitches that will create the bands. Here's our sweater! I'm so excited if you can't tell. The picking up happens first on the right front which is the side that goes on the righthand side of your body. The pattern instructions give us a number to pick up but since a lot of us added length in the body of the sweater we'll need to add stitches to that number because we have a longer edge now. There are two formulas to keep in mind while picking up. Pick up approximately 3 stitches for every 4 rows of knitting. Knit stitches are wider than they are tall so this ratio balances that difference so we avoid puckering or stretching. Pick up a multiple of 4 + 3. This might sound odd but it makes sense. The button band row is like this: P3, (k2, p2) to end. That means we want to have a wide 3-stitch section at the neck-edge of the button band to give us a place to pick up the neck ribbing. My size said to pick up 59 stitches which is (4 x 14) + 3 = 59. I had added about 1.5" to my sweater so as a result I picked up 67 stitches here. (4 x 16) + 3 = 67. Now, I can hear you all saying, "Heather, this is a lot to remember and what if I don't the right number?!" Well, I'm here to tell you that it's easy and you will get the right number. Just start at the bottom edge and pick up three, skip one, pick up three, skip one... all the way up the edge. Here's that that looks like. I've exaggerated the gaps here a bit but this is what you're aiming for. It doesn't make holes because everything fills in. Make sure to pick up in the same place on every row. That will create a nice uniform edge on the front of your sweater. If you don't like where a stitch happened, rip back and pick it up again! This goes quickly and it's one of the most visually important parts of the garment so be sure you're satisfied with it. When I picked up this edge I just went for it. I did the pick up 3 for every 4 and counted when I got to the top. I ended at 66 stitches which happened to only be 1 stitch away from a multiple-of-4+3. I ripped back about 10 stitches and eased that one extra stitch into place to end with 67. If you have ANY questions about this formula or how many stitches you might need to add for your sweater than PLEASE email me. We will figure it out! After we're happy with that first pick up edge then we can work the ribbing rows. It's just 5 rows and it goes fast. That's it! Now repeat for the left side of the sweater with the RS showing, begin at the neck edge and work your way to the hem. We leave all of these stitches on holders until after we complete the neck edge. 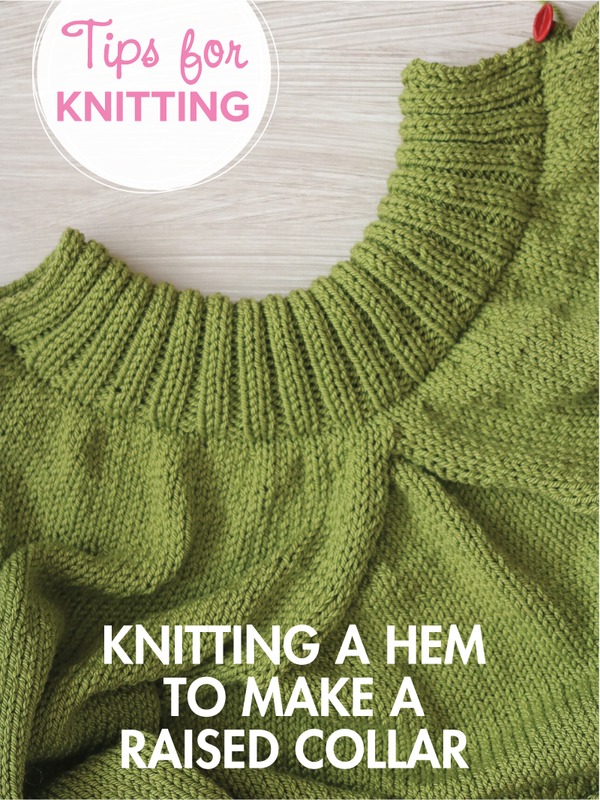 KAL, Knitting, Quick Knitting Tips! 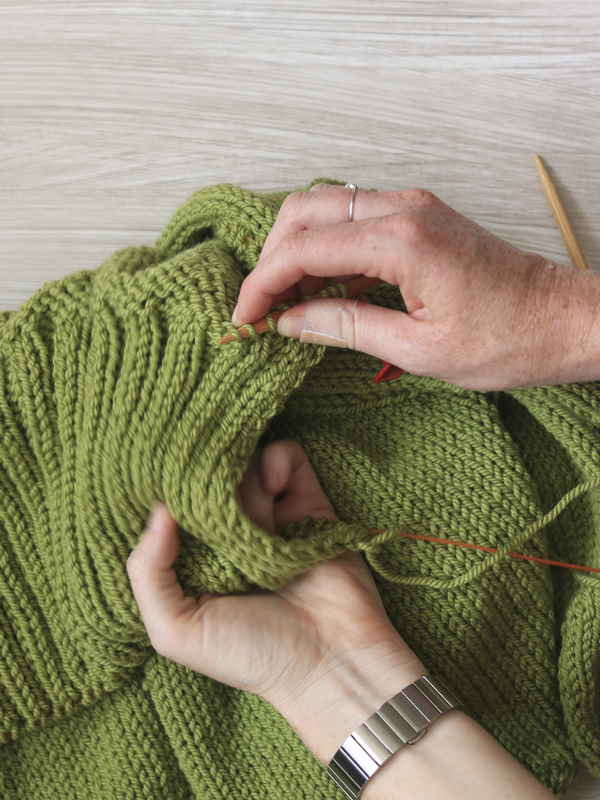 This is an unexpected post in the Carbeth Cardigan knit-along lineup but as I got to this point in the pattern I felt like there were some questions I was running into so I figured other knitters might have these questions, too. In Step 3 of the pattern when we finish the yoke shaping we end with 2 stitches before and after the front markers and 2 stitches between the back markers. That's great. The next set of instructions will take a few minutes of your attention. There are two sets of instructions here depending on the size sweater you're making so be sure to find your size and stitch counts before proceeding! The pattern tells us to decrease evenly across our neckline to really cinch the top of the sweater. This is something that always gets me -- How many times do I need to decrease and with how many stitches in between each decrease? Well, friends. I found a handy calculator for this! How to decrease stitches every across a row, a free calculator! MAGICAL! Thank you, Lucia for this knitting gift. Enter the number of stitches you have on your needle in the top box. (87 for me). Enter the number of stitches you need to decrease. (17 for me). Read what appears in the third box. This number should be 70 for all sizes. The calculator gives you two suggested rows. Choose which you'd like to follow and knit (or purl) your decrease row with confidence! 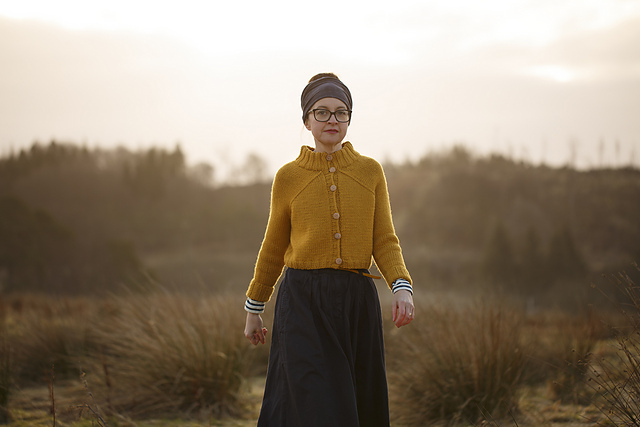 The decreases on the yoke of the Carbeth Cardigan are what make this sweater shine. One good thing to keep in mind about this cardigan is that we're not decreasing the sleeve stitches. If you've ever worked a regular raglan sweater we normally increase or decrease evenly across the body and sleeves to create the lines toward the armholes. On this sweater we're only decreasing the front and back stitches and all those sleeve stitches stay in place. That's what creates that really cool effect. We're going to be decreasing on EVERY row which is a little unusual and that's why the decrease lines are so pronounced. As we knit around the row we'll work a decrease either before or after a marker. It's important to do the right decrease at the right place each time. Before the marker is a right-leaning decrease or K2tog. After the marker is a left-leaning decrease so we SSK. K2tog: Knit 2 stitches together into 1. Single right-leaning decrease. SSK: Slip the next 2 stitches, one at a time as if to knit, to the right needle. Insert the left needle into the fronts of these two stitches and knit them together. Single left-leaning decrease. The same concepts apply for the wrong side or purl side of the work. We're working a left-leaning decrease (LLD) before a marker and a P2tog after the marker. Again, it's important to do the right decrease at the right place each time because that's what gives us those amazing lines up the shoulders. LLD: Slip the next 2 stitches one at a time as if to knit, insert left needle as if to SSK, remove right needle, purl these 2 stitches together through the back loop. Single left-leaning decrease. P2tog: Purl 2 stitches together into 1. Single right-leaning decrease. Check out these decreases! It's happening!